FILE - A Facebook logo is displayed in Paris, France, Jan. 17, 2017. “This was a major breach of trust. I am really sorry this happened. We have a basic responsibility to protect people’s data,” he told CNN. Facebook disclosed on Friday that it has known since 2015 that British researcher Aleksandr Kogan illegally shared users’ information with a research firm, after collecting that data legally through an application for a personality quiz. The research firm is alleged to have illegally used the data of an estimated 50 million Facebook users to build profiles for U.S. political campaigns, including the presidential campaign of Donald Trump. Facebook has been criticized for failing to alert its users to the incident in 2015. Wednesday was the first time Zuckerberg publicly addressed the issue. Included in his statement was a timeline of events that said Facebook demanded in 2015 that Cambridge Analytica delete all improperly acquired data. He said last week he learned from news outlets that the company may not have deleted the data, despite providing certification of having done so. 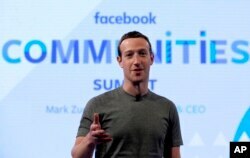 The Facebook founder outlined new precautions his social media platform will take to protect user data in future: identifying any other application developers found to have misused personal data, restricting the types of data available to developers, and ending their access to a user's data if the user has not used the app in the past three months. He also said Facebook will make it easier for users to revoke apps’ permission to use their data, by putting the tool at the top of a user’s news feed. Within an hour of its posting, Zuckerberg’s message had garnered more than 32,000 “likes” or other reactions and had been shared more than 10,000 times. User comments varied from fan club-style expressions of support to bitter complaints about Zuckerberg’s failure to speak sooner. While controversy has swirled, Facebook’s stock value has taken a significant hit. The company has lost more than $45 billion of its stock market value over the past three days. 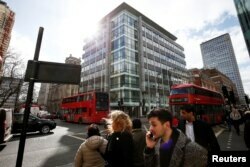 People walk past the building housing the offices of Cambridge Analytica in central London, Britain, March 20, 2018. With its more than 2 billion monthly users and billions of dollars in profit, Facebook has become a powerful conduit of news, opinion and propaganda, much of it targeted at individuals based on their own data. The social media site and investigators have found that Russia-backed operatives had used Facebook to spread disinformation and propaganda.